Oh bring back my Bonnie to me! Bring back, bring back, oh bring back my Bonnie to me! And bring back my Bonnie to me. I dreamed that my Bonnie was dead. And brought back my Bonnie to me. 1. This 18th century song from the north of England is an exampie of a `chanty '. My Bonnie means `my loved one '. 2. Ye: It is an old form of ` the '. If you go to England, you can stili see this old word on some signboards of shops and inns, especially in the country. For instance: Ye olde pork pie shoppe. British sailors have helped Britain during centuries, and their contribution to the building of the British Empire as well as to increase the British sea power and fame has been great. Some sea-men and ships have become legendary. Under Queen Elizabeth I, Francis Drake was the most famous of the sea captains and pirates who sailed the oceans. From 1577 to 1580 he voyaged around the world in his ship, `The Golden Hind' and he played an important part in the famous battle against the Spanish fleet in the summer of 1588. In 1869 the ' Cutty Sark', now preserved in a dry dock at Green¬wich, London, and opened to the public, was launched at Dumbarton on Clyde. It was built for the China tea trade, in which there was much rivalry between merchantmen to bring home the first of each new season's tea. The Cutty Sark outdistanced all rivals and proved herself one of the fastest of sailing ships, covering on one occasion 363 miles in 24 hours. Cutty Sark, in Scottish dialect, means «short shirt». This curious name was taken from the poem ‘Tam o'Shanter ' by Robert Burns where the witch Nannie appeared in a cutty sark. The figurehead of the ship represents Nannie. 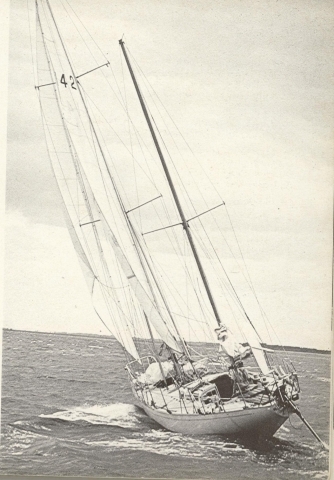 The latest of the great British sailors was Sir Francis Chichester who made his solo circumnavigation of the world from the summer of 1966 to the spring of 1967 in his 53 ft. ketch, ' Gipsy Moth IV ', now preserved in dry dock near the ` Cutty Sark'.